A deeper look at the grooves pressed into the 2017 vinyl reissue of Let Me Up (I’ve Had Enough) by Tom Petty and the Heartbreakers. Twelve years after they started, Tom Petty and the Heartbreakers found themselves in a fairly unique position in pop music: they’ve been working long enough and had been influential enough that radio waves were beginning to get crowded which artists who cited the band as an influence – or at least seemed like it. On any given day in the mid-to-late Eighties, one could turn on the radio and potentially hear music by Timbuk3, The Replacements, R.E.M., Soul Asylum, Los Lobos, The Black Crowes or innumerable others who were crowding the spaces that Petty and the Heartbreakers had been working for years and were (in some cases) stealing the band’s thunder pretty successfully. 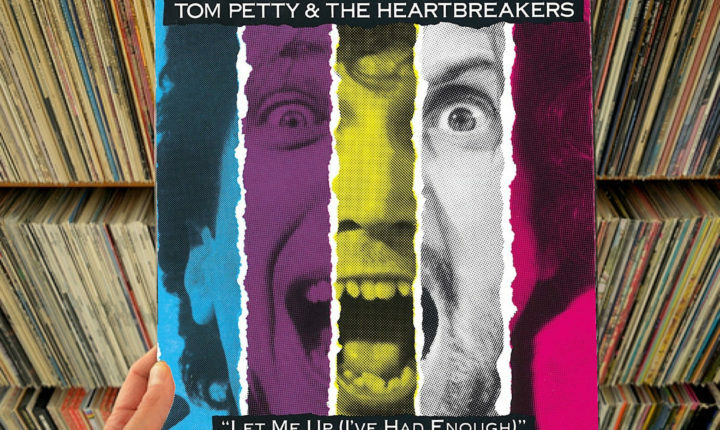 That was probably a little nerve-wracking for the band and, listening to Let Me Up (I’ve Had Enough) now, thirty years after its original release, t’s still very clear to hear a certain edge about each of the eleven songs on Tom Petty and the Heartbreakers’ seventh album. From the moment that the Bob Dylan co-written “Jammin’ Me” opens the A-side of Let Me Up, it’s easy to tell that something’s up with the band. There, while nothing sounds off about the music exactly (although the neatly clipped and gated guitar tomes can put a listener on edge), the song has a sort of intangible quality capable of making most everyone who hears it ill at ease and that sensation is furthered by Petty’s vocal performance (check out lines like “You got me in a corner/ You got me against the wall/ I got nowhere to go/ I got nowhere to fall”). By the end of the song, listeners will be engaged(the Heartbreakers’ magic is solidly in effect – and that overrides the unnerving qualities in this song) but also unnerved and on the edge of their collective seat thanks to the listening experience. A devil’s advocate could say that, while unconventional for this band, it is still something – but that’s a debate for fans to have among themselves. After the fairly uncertain beginning offered by “Jammin’ Me,” unfortunately the going doesn’t get any less dicey or touch-and-go as the album’s A-side progresses. While the chord progression and rhythm of “Runaway Trains” could have made the beginning of a classic Heartbreakers song, the maddeningly of-its-moment keyboard part supplied by Benmont Tench sounds like it was lifted out of an Eighties teen sci-fi or suspense movie which does nothing good for it, while the cast-off CCR workout which is “The Damage You’ve Done” could have been a “left-off” document from this album too. Such classicism may lead readers to believe that Let Me Up is the weed in Tom Petty and the Heartbreakers’ otherwise prize-winning catalogue, but that might be overstating the point a bit. While there’s no debating whether or not Let Me Up has some problematic points in it, it’s not a complete letdown. The sort of begrudgingly intoned “My Life/Your World” shows that even when the Heartbreakers are being moody, they can still come up with something which articulates that frustration well and “It’ll All Work Out” truly does live up to its name as the band shows just how much restraint they’re capable of by underplaying the song. That underplaying trend serves the dismissive “Ain’t Love Strange” (where Petty almost spits every syllable on his lyric sheet) very well on the album’s B-side too, and the calendar-conscious “How Many More Days” has just enough barbs in lines like “Can’t you see?/ It’s something I want babe/ It’s more than that, it’s something I need/ Oh little darling please be truthful, please/ Be faithful, please come now to me”to ensure that listeners don’t forget it after even their first exposure to it. The new, fortieth anniversary vinyl reissue of Let Me Up (I’ve Had Enough) is out now. Buy it here on Amazon.